Couple or young family seeking a luxury oceanside holiday? Look no further than Phoebe's Lodge in Greece. Couple or young family seeking a luxury oceanside holiday? Look no further than Phoebe's Lodge in Greece. Perched on a secluded waterfront site overlooking the blue hues of Mirabello Bay in idyllic Agios Nikolaos, this one-bedroom villa exudes modern luxury. 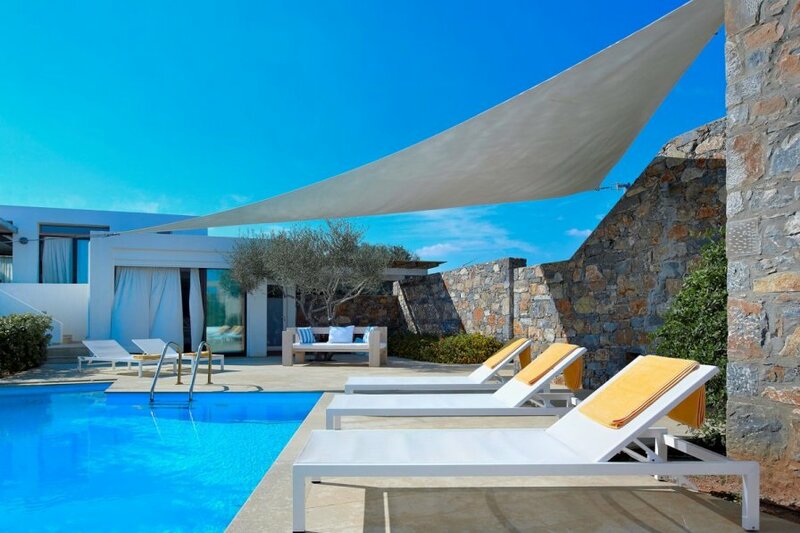 Located within an exclusive resort in Crete, you have the best of both world's – access to top-notch facilities and complete privacy. Sporting traditional Greek architecture infused with contemporary decor, Phoebe's Lodge gives off a casual chic feel that sets the tone for a relaxing and comfortable stay. Decorated in the purest white, combined with soft, earthy tones, the interiors blend seamlessly with the exteriors, creating the perfect indoor/outdoor ambience. There's a spacious and lavishly furnished open plan lounge which leads to an outdoor terrace with direct access to your private infinity swimming pool. There you can take a cooling dip or relax on the deck while enjoying panoramic views of the bay below. The bedroom, which sleeps up to two and comes with one baby cot, features a king-sized bed facing the beautiful sea and an en-suite marble lined bathroom complete with a Jacuzzi bath. Extra facilities include a fully stocked mini bar, flat screen TV and in-room safe. With air conditioning alongside beach towels and a hairdryer provided, Phoebe's Lodge has your needs covered. The resort's first-class facilities are all within a short 600m stroll through the private peninsula grounds of your villa. Unwind in the sauna and steam room, stay active in the fitness centre or dine al fresco at the on-site restaurant. To up the luxe factor even more, private chefs and butlers are available on demand and you can enjoy spa treatments in the comfort and privacy of your villa. With access to the sea below, the harbour town of Agios Nikolaos nearby, and the pretty town of Elounda and the island of Spinalonga, just a short drive up the coast, Phoebe's Lodge is ideally placed for exploring more of what this charming part of Crete has to offer. Lying east of the capital Heraklion is Agios Nikolaos, a picturesque coastal town on the idyllic Greek island of Crete. It's encompassed by picturesque hilly terrain and overlooks the shores of the curving Mirabello Bay. With soft sandy beaches, quality local tavernas and a welcoming atmosphere it's a perfect place for a couple or family-friendly holiday. In the centre of Agios Nikolaos, you can explore the marina or see the deep lake, connected to the sea by a narrow inlet. Both are surrounded and overlooked by quaint cafes, restaurants and local tavernas where you can pick up local cuisine, including fresh sea food. Wander around the shops with original items from woven fabrics to China and local delicacies on offer. To immerse yourself in the culture, you can head to one of the ancient churches, scattered within the streets, including the small church which lends its name to the town. Soft sandy beaches, including Kitroplatia and Havania, surround the town, and one of the region's most popular spots is Palm Beach, on the east coast. All boast clear, calm waters, perfect for swimming and families with smaller children. Behind Agios Nikolaos, the rural villages of the Lasithi Plateau add another facet to Eastern Crete's fascination. For day trips, you can drive to the island's capital Heraklion. The vibrant port city is best known for the Palace of Knossos. The archaeological site dates back thousands of years to the Minoan civilisation. A drive around Heraklion will also bring you to sleepy traditional villages, Medieval castles, Byzantine monasteries and secluded coves.